Ekiti State Governor, Mr. Ayodele Fayose , has said policemen deployed in the state for the Saturday governorship election stormed the pavilion where the Peoples Democratic Party was holding their rally and harassed him . The governor, who emerged with a neck brace narrated his ordeal and asked supporters of the party to remain resolute and vote for his deputy , who is also the governorship candidate of the PDP , Prof. Olusola Kolapo . 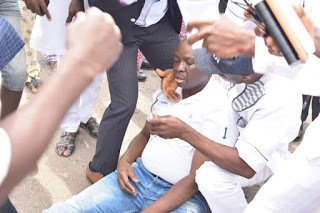 Fayose , who burst into tears while speaking with journalists said he was slapped , kicked and shot at by the policemen and said the Inspector General of Police should be held responsible if anything happened to him . “ But I want you to be of great courage. This battle must be won . This is an army of occupation . I want you to stand and remain standing . “ I hope they will not cause 1983 crisis. I call on the international community, Ekiti is under siege . How can I be the governor of the stage and be treated this way? I will go back to the hospital and remain there for a while .